Drew Zahn Talks "Secession Madness"
In light of the recent election results, thousands of people across the United States started petitions to the government requesting that their state secede from the Union. Drew Zahn, news editor at WND, joins Jason Hartman for a discussion about this movement that immediately followed on the heels of Obama’s re-election. Drew and Jason talk about states’ rights, pointing out that many citizens feel our individual rights are also being infringed upon through some of President Obama’s mandates, such as healthcare reform. The movement began with one gentleman in Louisiana asking for a peaceful secession from the Union for his state and very quickly snowballed. Drew explains the legality involved in secession, noting that there are three ways that a state can leave the Union. For details on this issue, please visit www.HolisticSurvival.com. Citizens in all 50 states have petitioned the White House, with many states having acquired more than enough signatures to meet the requirement of the government’s policy for petitions. Jason and Drew discuss the ramifications, good, bad and difficult, of a state actually legally seceding. Drew Zahn is a reporter, movie critic and one of the news editors at WND.com, the nation’s oldest, largest independent online news source. A graduate of Bethel University in St. Paul, Minnesota, Drew Zahn is a former pastor, who cut his editing teeth as a member of the award-winning staff of Leadership, Christianity Today’s professional journal for church leaders. He is the editor of seven books, including “Movie-Based Illustrations for Preaching and Teaching,” which sparked his ongoing love affair with film and his weekly WND column, “Popcorn and a (World)View.” He and his wife and their 16 children live in Iowa. Jason Hartman: It”s my pleasure to welcome Drew Zahn to the show. He is an author for World Net Daily, and one of the editors there as well. And he has been covering most recently something that is very topical, and that is the movement that has now spread to all 50 states since Obama”s reelection and that is the secession movements that you”ve probably read and heard about. So Drew”s here to tell us more. Drew, how are you? Drew Zahn: I am doing very well, thank you. Jason Hartman: Good. And just out of curiosity, I always like to ask my guests, where are you located today? Drew Zahn: I live in Iowa. Jason Hartman: So anyway, what is going on with this secession movement? Is it just sort of a gesture, is it just kind of like sort of a dumb protest? Or is there some real momentum behind this? Drew Zahn: Well I think there are a lot of people across the country who are feeling that the federal government has indeed abandoned some of its founding principles of our constitution and so forth. And yet, these people may feel these things kind of quietly, kind of in their living rooms while they”re watching the television and whatnot. But what happened was, basically this movement to create these petitions just kind of got publicized. I”ll toot my own horn a little bit – I”m the one who found this thing and first broke the story on WND.com about this secessionist petition. And I think what”s happening is people are just saying, hey here”s somebody who thinks like me or who”s willing to take a radical step like me, and I just want my voice to be heard. I want to try to push this forward so that people can kind of, I think it sort of became almost a social gathering place around each petition. Hey, here”s another person and another one and another one like me. Jason Hartman: Well I have long predicted, and when I was talking about this ten years ago when I felt the federal government was just becoming far too intrusive and overstepping their authority, and I”m a big states rights advocate. For a long time I’ve been saying that there will be a secession movement. And if we live out our natural lives hopefully, well hopefully we will live out our natural lives I should say, that we will see an actual secession. I guess the likelihood is it might be Texas first. Even their governor Rick Perry mentioned it a few years back, and I think it was kind of a casual remark when he said it. But at some point, when the federal government is taking such a big tax bite, I think the states just look at it, if nothing else as a simple business decision. We could contract, a state might think, we could contract with the federal government to provide defense, we could create our own defense department internally. What are we really getting from the feds except a bunch of overreaching stuff, unfunded mandates, all sorts of things like that. It doesn’t seem like there”s really that much benefit coming from the federal government frankly. Drew Zahn: Well there has been for years now, you mentioned about ten years ago or what not becoming aware of this, really the idea that a state or a state”s rights may be infringed upon, that goes back more than a hundred years and that goes back even before the civil war in where a secession was such a big deal. But I think the thing that is really sort of pushing this just right now, is that there have been people talking about state”s rights being trumped upon, but that”s kind of vague. That”s sort of an abstract concept. But just recently, we have a president who created a health care program that for a lot of people stood up and said hey, wait a minute, some of these mandates, in particularly the contraception coverage, this violates rights of conscience, this violates religious liberties. That”s first amendment kind of stuff. We”re not just violating state”s rights now, the federal government, it”s violating individual”s rights. And I think that”s kind of a wakeup call. This isn”t so abstract anymore. This is very concrete. And that”s some of the concept that we”re seeing as we read through these different petitions. They”re not all worded the same. Some of them point out that our fundamental rights are being violated, not just as states, but as individuals. Jason Hartman: I don”t disagree. You won’t get any argument from me on that. But these are some of the issues behind this secession movement. First of all, how big is it? It was just immediate after the election I stated hearing this. And then I remember hearing it went to 40 states, it was just a few and then there were 40 of them, and now it”s all 50. How big are these movements? I guess there”s 25,000 signature kind of a hoop that they need to jump through to be taken seriously on a petition, or how does that work? Drew Zahn: Yeah, let”s go a little bit to the background. A website called WeThePeople, it was created by the white house and you can find it at petitions.whitehouse.gov. And on that website, basically what it says is because we have a first amendment right to petition our government, the white house created this so that they could send in the petition. And if they could get 25,000 signatures the white house pledged that it would be put on a list of petitions that they would answer. Jason Hartman: Under which president was the WeThePeople site created? Jason Hartman: Good window dressing on Obama”s part. It”s all about the marketing message more than the reality nowadays unfortunately. Drew Zahn: Well, what happened was a day after Obama was elected, a gentleman named Michael, we don”t even know his last name because last names don”t appear on the website, but a gentleman named Michael from Slidell, Louisiana created a petition. He wanted Louisiana to be able to peaceable secede from the Union. Jason Hartman: Was that after the reelection or the first election? Drew Zahn: After the reelection, the one most recently. And it got a couple of thousand signatures, just a few people knew about it, then on Friday of last week, let”s see that would be November the 9th, I got a chance to take a look at it. Saw it, and wrote up a little news article on WND about it. Well, what happened was over the weekend, some 300 thousand people read that article and they started signing, and they started signing, and they started adding states. Texas got added, Florida got added, and soon it just began to snow ball. Now the state of Louisiana a long time ago, has passed that 25,000 signature threshold. The state of Texas has passed 100 thousand signatures. Jason Hartman: Leave it to Texas. Drew Zahn: There”s now all 50 states, even as blue as states as you can get, Hawaii, Massachusetts, Road Island, whatnot. These states have added petitions as well. My last count was a couple days ago. It was up over 500 thousand total signatures if you add up all 50 states. I”ve since heard it”s up over 600 thousand. It keeps growing and growing. Jason Hartman: So, I”ve just got to say, I kind of, I don”t want to be called a traitor or anything, or not a team player, but I kind of like this. I think it”s good that people are thinking this way and trying to keep the federal government monster in check. At least it sends a message. I doubt there”s going to be any real secession. But at least it kind of sends a message, hey folks you can”t just tread all over us, as the Gadsen flag would say, don”t tread on me. But Obama was elected by, what was the popular vote? Like 62 million people or something? 500 thousand, this is nothing. This is like pocket change, right? Drew Zahn: Well, right. To a degree what we”re looking at is simply people trying to kind of make some noise, get their voices heard and so forth. And you do of course have the whole question of whether secession is even legal or not. Whether it can happen. If you”d like, I can address that. Jason Hartman: Sure. Yeah, because I’ve always heard, and I”ve heard it for years but recently when I saw something on TV about it, I hear now that it”s a myth, that there is something in the constitution of the state of Texas that allows it to secede. That it is different from every other state in the country. Talk about the legality if you will. I”m just sort of wondering, if it ever really got to the point where a state was really trying to do this, would the federal government roll tanks in there and start killing people and really push this down? What could we see happening? Drew Zahn: That was basically Abraham Lincoln’s solution. Jason Hartman: Okay fair enough, yeah go ahead. Okay, so to legalities. Drew Zahn: There are three different ways that a state could theoretically leave the union. Two of these ways, Supreme Court decisions, and previous presidents and most legal scholars agree, are perfectly legally and one of them is very controversial. So let”s start with the legal ones. First, a state can leave the union if they have approval from the other states. In other words, if Florida wants to go its own way and the rest of the US is okay with it going its own way, it can be sent off. Jason Hartman: Right, but do you have to get 49 other states to approve? Drew Zahn: Well, we don”t have a formal process written in the constitution for that. It”s largely agrees upon by legal principle and by a Supreme Court decision, Texas versus White in 1869, which came right after the civil war, which is one of our most significant supreme court decisions on this. They did leave that as an option. But we don”t have any process for how to go about doing that. The second method is by revolution. Write your declaration of independence, take up arms against the United States, and cut yourself loose. Again, that Supreme Court decision and other presidents in the past have said, yeah well you can do that. Jason Hartman: Well, I have to say that I think the rallying cry might be one from history, and we”ve all heard it, here it goes: Taxation without representation. Because certainly I think that”s happening nowadays. Drew Zahn: That”s what largely field the secession movement of 1860. There had been a big bubbling movement of division within the country and then what happened in 1860 was you had a president that was elected entirely from states in the north. Not a single southern state voted for Abraham Lincoln. At that point they felt like, the southern states, felt like there was nothing they could do. They were going to be taxed but they had no voice in electing the president. Jason Hartman: I”ve just got to say, if anybody thinks as I used to that Abraham Lincoln was this incredibly great guy, read the book Dishonest Abe. It”ll change some of your perceptions about Lincoln. He did some pretty bad things, I’ll just put it that way. I think it”s by Dilorenzo, I can”t remember the author, but anyway go ahead. Drew Zahn: So as a member of the press I am well familiar with some of the things that Lincoln did. But again there”s a third method that potentially a state could leave the union and that”s called secession. And that”s where a state will just say, I don”t want to be a part of the United States anymore. This is extremely controversial. It”s been controversial for more than 200 years, even before the constitution was written. There was a lot of question about whether a state could or couldn”t do that. Patrick Henry, for example, didn”t want people to sign the constitution because he was afraid of how states would get trapped up by an ever growing federal government. Thomas Jefferson was a voice saying that a state could in theory secede. Many legal scholars through the years have felt that, have believed that this union we have is voluntary. But on the other side, on the other hand, many scholars feel the exact opposite. And in fact, if we go to 1869 Supreme Court case, Texas versus White, the Supreme Court (and keep in mind, it”s right after the civil war) but Texas versus White, the supreme court did rule that it was unconstitutional for a state to secede. That we are in an indivisible union. Now, just because the Supreme Court decided it ought to be so, doesn”t mean that it necessarily ought to be so. I think you could argue that the Supreme Court has made lots of decisions that were unconstitutional themselves. The Supreme Court can get things wrong. So here we are a couple hundred years later and the argument is still fresh and on the table. Jason Hartman: So, anything more on the legality side of it? Drew Zahn: Well there”s lots of in particulars. You asked about how a state could do it practically in terms of the armed forces and what does a state get from the federal government. I think one of the things that people are really concerned about, and I’ve seen emails about this on my own email account, is people are concerned about all of the entitlement programs. They”re all coming from Washington DC right now. 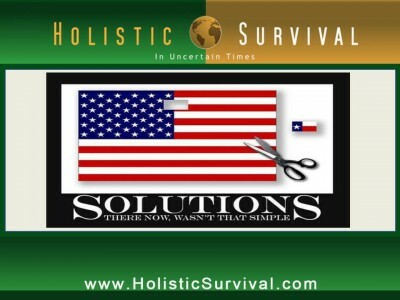 If a state were to cut out, let”s say Texas just gets up and leaves somehow, they”re able to do it. There”s no more money for Texas residents for social security or Medicare or so forth. Texas will have to figure out how to do all that on their own. Jason Hartman: Yeah, but Texas doesn”t even have really an income tax except on a corporate level. Their property taxes are high and they”re doing such a good job. See, what I think would happen, and I’m just thinking out loud but I”ve said this for a long time now, at least I”m going to say 5 years. I”ve been saying this on my show, so it”s documented. I”ve always said, and maybe halfheartedly, half-jokingly, that is Texas were to secede from the union, it would become the Hong Kong of the United States where productive people would just flock. And its economy would boom. Remember compared to the old China? Even nowadays, but less so than before. But the old China versus Hong Kong under British rule, it was like this gleaming example of capitalism. And I think that”s what would happen if people could migrate. See that”s the thing that would really bother the feds, is that if there were a secession movement, it would be the typical brain drain, which is the reason they put up the Berlin Wall. Because the Soviets couldn”t keep it together. They had to force people to stay it. They couldn”t keep them there voluntarily. People wanted to go where there was opportunity for prosperity and rewarding good behavior and ambition. Look at the migration that”s happening now from California, my home state by the way, I now live in Phoenix Arizona, and every smart person I know that can do it reasonably is leaving California or trying to leave California. It”s unbelievable. It”s just a massive brain drain of ambitious middle class people that are just running from that state. And I think that”s what would happen if we were to see a secession to a more libertarian type of government in the state that seceded. I think people would just go there that wanted that type of government, they would have a market place of choice. Which I think they should have. Drew Zahn: In many of the Emails I have received have been exactly along those lines, people saying by all means if Texas goes, or Florida or Louisiana, if one of these states goes, I”m ready to move there. I”m ready to go. I think that sentiment is definitely out there. Jason Hartman: So, tell me more. I kind of interrupted you with that thought. Drew Zahn: We talked about the legality of it and now we”re talking about the possible ramifications of it. And certainly that”s one. Where you would see people get up and go. And one of the reasons I think that”s so appealing, you mentioned Hong Kong versus China, I was thinking East Germany versus West Germany, you brought up the Berlin Wall too, is that many people who are behind this secessionist movement, if you read what they wrote in the petitions themselves, you see what they”re saying is, that there is certain freedom, an economic freedom, a personal liberty freedom, that our founding fathers envisioned. And they suggest online casino australia that that vision and that freedom is what led to our prosperity. And as we as a nation have abandoned those principles, as we have surrendered our freedoms or had them taken from us, we”re losing prosperity. The two things go hand in hand. If one of these states was able to break off and form their own country, if they reverted back to the principles of the founding fathers, that kind of liberty, that kind of freedom, you”d see in theory that that second nation, that new nation whether it was Texas or whoever it was, would have an opportunity for economic freedom that as you pointed out, doesn”t exist in California for example, because of their taxes and because of their over regulation and because of their excessive spending and so forth that”s crushing their economy. Jason Hartman: It used to exist in California. It just doesn’t anymore. It”s like what Reagan said when he left the democratic party. He said, “I didn”t leave the democratic party. They left me.” and that”s kind of how I feel about California. I used to love California. I thought it was the greatest place on earth. It just became such a disaster over the years. Drew Zahn: Well what you”re talking about happening in California is what a lot of people are saying is happening to the united states as a whole. Jason Hartman: And I agree with you. I just think that if you”re going to stay within the US, at least get into a more friendly state. That”s the first step. Drew Zahn: That may very well be true. Jason Hartman: Let me take a brief pause. We”ll be back in just a minute. Drew Zahn: All they”ve promised is to put it on a cue for petitions to be answered, and they have answered some petitions. For example, the white house was petitioned for what it”s recipe for homemade beer was. And they answered that one. Obviously, this is making news. Jason Hartman: Well, we”re definitely endangering minors here. Did that homemade beer come from the beer summit? Drew Zahn: Something like that. Jason Hartman: Talk about, what did the Romans call it? Bread and circuses, right? Distract people with bread and circuses. Okay, alright, go ahead. So they gave people the beer recipe, what else? Drew Zahn: Right, now these petitions are making news. They”re clearly exceeding the 25,000 signature threshold. The pressure is on the White House to do something, but to be perfectly honest, the white house has been pressured to do all kinds of things and they haven”t followed through on it. So this movement, whether anything is going to come from this immediately, directly, is kind of at the mercy of what I would expect to be a very uncooperative white house. They would probably like this to just go away. The question is, is this the end game or is this something more? If these people aren”t heard on the white house website, are they going to do something else? Are they going to start petitioning their state governments? Once they start doing that, if they start doing that, that”s when you might actually see something happen. Jason Hartman: And so who do you think would be the first to try and go? Would it be Texas? Drew Zahn: Well there is certainly an independent streak that exists in Texas and there is certainly, you mentioned that Gadsden flag sort of spirit of don”t tread on me, that”s alive and well in Texas. I wouldn”t be surprised. You mentioned earlier sort of a myth that Texas still has the ability to do that, that it”s written in their constitution and whatnot. I don”t have the constitution in front of me, but I do know that the Houston Chronicle for example, reported that that is a myth, that isn”t actually true. But still, they have that rallying cry, we were our own country once before and we can do it again. And they”re the only state that I know of, well besides maybe Hawaii, that has that rallying cry. Jason Hartman: Very interesting. What would they do? What would it look like? Just kind of paint the picture for us as to how it might look. I know this is all a prediction, but they would go to their state government, people would sign petitions, how many would they have to get and then what would happen? Drew Zahn: Well they”d have to get their elected representatives to take action. It would require…just a petition doesn’t affect anything unless it pressures elected representatives to do something. So you”d probably have to have some sort of resolution or declaration on a part of the state congress, probably signed by the state governor at that point. Then I’m thinking lawsuits because the federal government is not going to want to appeal that to Texas versus White in 1869 and say that it”s illegal. And then, assuming that the Supreme Court upholds the federal government’s position, then you”d have to see how determined the state is. Are they willing to go one of the other two options? Are they willing to go to revolution? That”s a big question. Jason Hartman: Let”s just talk about that scary thought for a moment, because that”s a scary thought, to think that it would get so bad in a country like America that was founded on such beautiful principles, just when I think and talk about them they give me goose bumps. To think of the incredible nature of our history and how it came about at a time when this was just a totally new idea, back in 1776, or really before that. So a revolution. Texas doesn”t have its own military. Would any federal military bases in Texas, would all of those individual troops decide hey, I”m going to be on the side of Texas? Drew Zahn: Well what you”re describing is exactly what happened in South Carolina in Fort Sumter. And the other fort that escapes my mind, it”s right across the bay there from Fort Sumter. But you had a situation where people stationed in the same base from the same city, had to make a call who”s side they”re on. But let me just quickly touch upon what isn”t being said. Most of these questions about, well would it even be possible? Could it happen? I don”t understand how Texas could possibly pull it off. All of those things, those statements, assume that a federal government is in the same position that it is right now. We have a federal government that”s 16 trillion dollars in debt. We have a federal government that cannot possibly sustain its level of spending, and even if it goes crazy with taxes, it can”t make up for what it”s been doing. We have economic instability looming on the horizon here. If the federal government would falter, if the federal government couldn”t pay their soldiers. If the federal government couldn”t pay for its benefits that everyone has been depending on and all of the sudden you have the hundreds of thousands of seniors in the state of Texas who aren”t getting their social security checks anymore, and the federal government can”t afford to fight a revolution, that is when you could see states seceding by revolution successfully. Jason Hartman: Here”s the problem. The federal government can”t afford to pay for any of that stuff now. The only reason it”s doing it under the illusion of paying is that it”s just paying in devalued dollars. It”s paying through inflation by printing fiat money. It”s just stupid. Drew Zahn: Right. I have a box in my dresser over here that”s got a 5 million deutsche mark bill. What is that? That is a government that tried printing 5 million dollar bills, when that money wasn”t worth the paper it was printed on. Well, if we continue with the fiat money, if we continue this spending and these incredible levels of debt, it won’t look that different from Germany when they printed 5 million dollar bills and it wasn”t worth 5 cents. Jason Hartman: It probably won’t look too much different from the Weimar Republic, but the problem is, and I talk about this frequently on the show, that nobody really knows when the gig will be up for the American smoke and mirrors economy, because none of these countries, whether it be Zimbabwe, Weimar Republic, Hungary, Chile, history is replete with these examples, right? But none of these countries have the world”s most powerful military. None of them had the reserve currency, which is meaningless if you can”t get everybody to play ball, but the way you get them to play ball is you have the military. You throw your weight around in that way. And that”s the thing. We might be able to kick this can down the road for three to five more decades. Nobody knows. Logically and mathematically, yeah, the gig should be up. But this is not a logical mathematical game when you have these different sets of circumstances. And to me it really all comes down to the military. It”s just, at the end of the day, when things get really ugly, if you can force your will on other countries and maintain reserve currency status, you can inflate for a long time. Drew Zahn: Well the first talk of secession began at the end of the 1700″s. The states didn”t actually succeed at seceding, well they never seceded, but didn”t actually pull off the secession attempt until 1860. So we”re talking 60-70 years of boiling before something significant really happened. We had the civil war. You just mentioned 3-5 decades, I just mentioned 6-7, we don”t really know when something”s going to happen. These could be, and I”m not suggesting I want them to be, but these could be sort of the beginning birth pains of what the future might look like. Jason Hartman: Very interesting and pretty ominous stuff, really. Hey, Drew give out your website if you would. Tell people where they can read your stuff on World Net and just learn more. Drew Zahn: These news articles as well as many other news articles covering contemporary issues, political issues, issues from people of faith, all these can be found at WND.com. Jason Hartman: Wnd.com. Fantastic. Well, Drew Zahn, thank you so much for joining us today. Appreciate it.